Let's start indoors. Let's start by imagining a fine Persian carpet and a hunting knife. The carpet is twelve feet by eighteen, say. That gives us 216 square feet of continuous woven material. Is the knife razor-sharp? If not, we hone it. We set about cutting the carpet into thirty-six equal pieces, each one a rectangle, two feet by three. Never mind the hardwood floor. The severing fibers release small tweaky noises, like the muted yelps of outraged Persian weavers. Never mind the weavers. When we're finished cutting, we measure the individual pieces, total them up -- and find that, lo, there's still nearly 216 square feet of recognizably carpetlike stuff. But what does it amount to? Have we got thirty-six nice Persian throw rugs? No. All we're left with is three dozen ragged fragments, each one worthless and commencing to come apart. Now take the same logic outdoors and it begins to explain why the tiger, Panthera tigris, has disappeared from the island of Bali. It casts light on the fact that the red fox, Vulpes vulpes, is missing from Bryce Canyon National Park. It suggests why the jaguar, the puma, and forty-five species of birds have been extirpated from a place called Barro Colorado Island -- and why myriad other creatures are mysteriously absent from myriad other sites. An ecosystem is a tapestry of species and relationships. Chop away a section, isolate that section, and there arises the problem of unraveling. For the past thirty years, professional ecologists have been murmuring about the phenomenon of unraveling ecosystems. Many of these scientists have become mesmerized by the phenomenon and, increasingly with time, worried. They have tried to study it in the field, using mist nets and bird bands, box traps and radio collars, ketamine, methyl bromide, formalin, tweezers. They have tried to predict its course, using elaborate abstractions played out on their computers. A few have blanched at what they saw -- or thought they saw -- coming. They have disagreed with their colleagues about particulars, arguing fiercely in the scientific journals. Some have issued alarms, directed at governments or the general public, but those alarms have been broadly worded to spare nonscientific audiences the intricate, persuasive details. Others have rebutted the alarmism or, in some cases, issued converse alarms. Mainly these scientists have been talking to one another. They have invented terms for this phenomenon of unraveling ecosystems. Relaxation to equilibrium is one, probably the most euphemistic. In a similar sense your body, with its complicated organization, its apparent defiance of entropy, will relax toward equilibrium in the grave. Faunal collapse is another. But that one fails to encompass the category of floral collapse, which is also at issue. 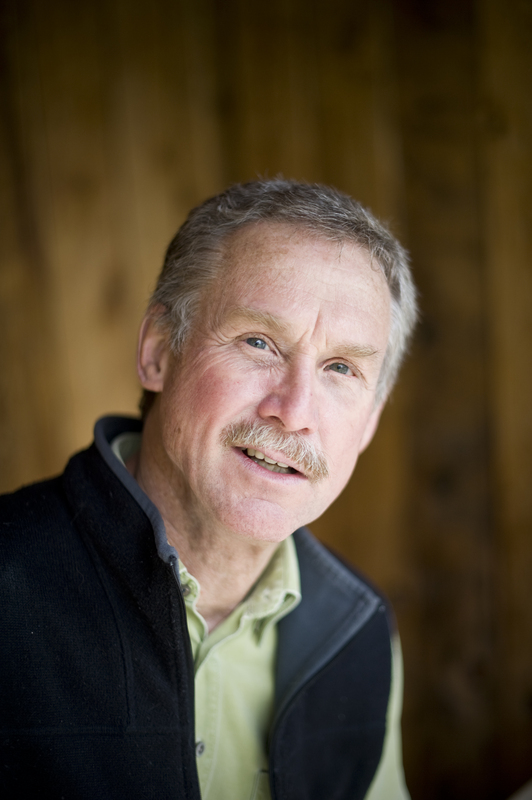 Thomas E. Lovejoy, a tropical ecologist at the Smithsonian Institution, has earned the right to coin his own term. Lovejoy's is ecosystem decay. His metaphor is more scientific in tone than mine of the sliced-apart Persian carpet. What he means is that an ecosystem -- under certain specifiable conditions -- loses diversity the way a mass of uranium sheds neutrons. Plink, plink, plink, extinctions occur, steadily but without any evident cause. Species disappear. Whole categories of plants and animals vanish. What are the specifiable conditions? I'll describe them in the course of this book. I'll also lay siege to the illusion that ecosystem decay happens without cause. Lovejoy's term is loaded with historical resonance. Think of radioactive decay back in the innocent early years of this century, before Hiroshima, before Alamogordo, before Hahn and Strassmann discovered nuclear fission. Radioactive decay, in those years, was just an intriguing phenomenon known to a handful of physicists -- the young Robert Oppenheimer, for one. Likewise, until recently, with ecosystem decay. While the scientists have murmured, the general public has heard almost nothing. Faunal collapse? Relaxation to equilibrium? Even well-informed people with some fondness for the natural world have remained unaware that any such dark new idea is forcing itself on the world. What about you? Maybe you have read something, and maybe cared, about the extinction of species. Passenger pigeon, great auk, Steller's sea cow, Schomburgk's deer, sea mink, Antarctic wolf, Carolina parakeet: all gone. Maybe you know that human proliferation on this planet, and our voracious consumption of resources, and our large-scale transformations of landscape, are causing a cataclysm of extinctions that bodes to be the worst such event since the fall of the dinosaurs. Maybe you are aware, with distant but genuine regret, of the destruction of tropical forests. Maybe you know that the mountain gorilla, the California condor, and the Florida panther are tottering on the threshold of extinction. Maybe you even know that the grizzly bear population of Yellowstone National Park faces a tenuous future. Maybe you stand among those well-informed people for whom the notion of catastrophic worldwide losses of biological diversity is a serious concern. Chances are, still, that you lack a few crucial pieces of the full picture. Chances are that you haven't caught wind of these scientific murmurs about ecosystem decay. Chances are that you know little or nothing about a seemingly marginal field called island biogeography. 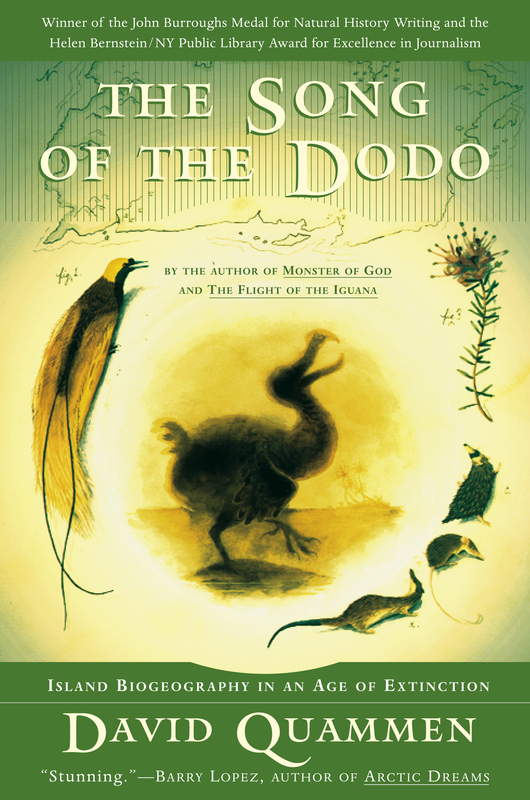 Discuss the ways in which Quammen's The Song of the Dodo is part adventure story, part scientific study, part travelogue, part murder mystery, part history book, and part biography. Comment on Quammen's writing style and his ability to impart difficult scientific material in both an interesting and understandable way. Why do you think Quammen chose to use as his title figure the dodo bird, a large-headed, big-butted, lumbering, flightless bird? What does the dodo bird represent in the book? Why in particular did he choose to mention the song of the dodo? What resonance does this have? Why do you think Quammen invests so much time dispelling the fictional stories of science, stories based more on convenience and tidiness than on the truth -- such as Darwin being portrayed as the sole mind behind the theory of evolution, when in fact there was another man named Wallace who came upon it on his own? The Tasmanian Aborigines were driven to the brink of extinction by the colonial settlers in the late 19th century. Compare their fate to the extinction of the dodo bird in the 1600s. Why is it so resonant? How is it haunting? What implications does it have for the human race? Why is Quammen's book so powerful? In what ways did it change your view of the natural world? Did it in any way alter your perspective on your own life and on life itself? If so, how? Near the end of The Song of the Dodo Quammen writes, "Yes, Simberloff predicts, the current cataclysm of extinctions is indeed likely to stand among the worst half-dozen such events in the history of life on Earth. This time around, we're the Death Star. But with a difference. Our own devastating impact on the biosphere will probably be a singular event, not part of a recurrent pattern. Why? Because we probably won't survive long enough, as a species, to find out." Do you believe the extinction of our species is, and always was, inevitable, or do you believe we have the ability to turn the tide and should, in fact, intercede on our planet's behalf? What is conservation biology and how important does Quammen lead us to believe it is in the prevention of animal and plant extinction? Discuss the conservation biology work that is being done, and its rate of success. For example, review Carl Jones's work with the kestrel in Mauritius, and Lovejoy's experimental work in the Amazon. At the end of The Song of the Dodo, Quammen returns to Aru to find the bird of paradise which Wallace had described so poignantly a century ago. "Even before we have reached the lekking tree on the second ridge" Quammen writes, "my question about Aru has been answered. The sad, dire things that have happened elsewhere in so many parts of the world ... haven't yet happened here. Probably they soon will. Meanwhile, though, there's still time. If time is hope, there's still hope." What, in the content of this paragraph, alters the ominous foreboding of The Song of the Dodo? Do you believe there is still hope? What do you think needs to be done in the time we have left? Did reading this book make you want to help in some way to preserve our world? If so, what way or ways did you consider? Would it alter the way in which you live your life? Did The Song of the Dodo spur you to travel, to find yourself on a boat chugging up some distant river to catch a glimpse of the indri or to hear the song of the cenderawasih? Where did it tempt you to go and what did you imagine you'd like to see?